The Ministry of Labor (MOL) announced that the monthly minimum wage in Taiwan will be increased from NT$20,008 (US$639) to NT$21,009 with effect from January 1, 2017. However, there are 54.6% of TFCF assisted families whose monthly income are still under NT$20,000 and 80% of vulnerable children living with a single parent or grandparents. Most of them are unable to keep the stable job due to the low level of education or illness. They can only have low-paid and insecure part-time job or home-based work. 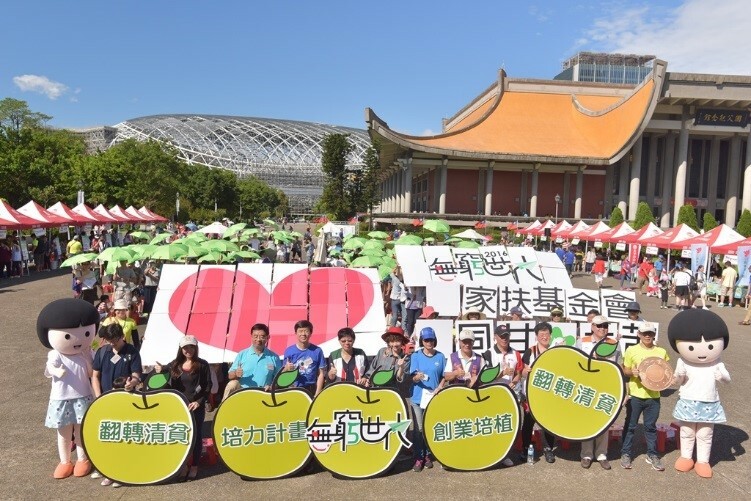 TFCF held the 3rd Bitter-Sweet Experiential Day in National Dr. Sun Yat-sen Memorial Hall on October 16, 2016. Through interactive and barricade-breaking games, TFCF provided opportunities for the public to experience poverty as it was by assuming the role of a person living in poverty. There were many handmade products from 10 assisted families and people could support them by purchasing their products in the event. Over 1,000 people participated in 2016 TFCF 3rd Bitter-Sweet Experiential Day and many of them were involved in sewing umbrella canopies to experience the low-wage work. Through the activities, TFCF would like to call on the public to support and donate money to help the needy children and families. Let children satisfy their hunger, preserve their health, provide them with education and emergency assistance, and have opportunities to significantly reduce poverty further. Join TFCF “Anti-Poverty campaign”, you may see that your small change means a big change for needy children and help them create a bright future. If you would like to read more about our Press Release, please visit our press room.